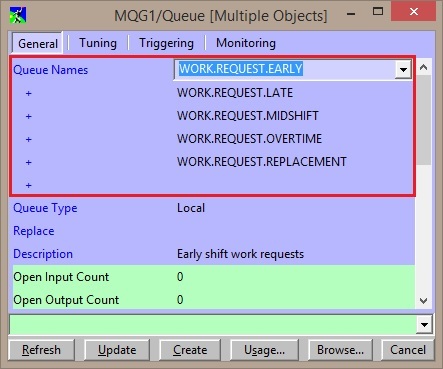 MQGem recently delivered a new version of MO71 that supports the new IBM MQ V9 release. As well as support for the new command level, there were a number of other features in this new version of MO71. One of those new features was a customer request for a way to alter multiple objects at once when those objects reside on different queue managers. Then open the definition with the context menu Open…, and you will see that MO71 presents you with a single dialog that shows all your selected queue names. and all other attributes will remain as they were. For example, all the descriptions of my queues were different and they stay as they were. 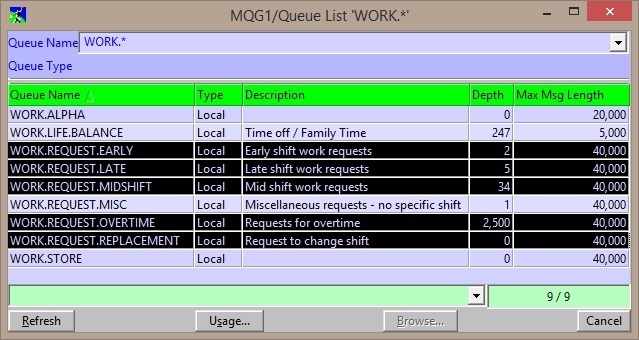 In recent versions of MO71, a feature was added that allows you to view multiple queue managers’ objects in one list dialog. 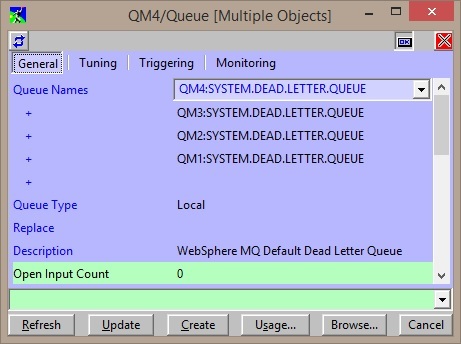 In this most recent version of MO71, selecting and changing multiple objects from this dialog where those objects are owned by multiple queue managers, now brings up the same dialog as shown above – just one dialog – and lists all the queue names. There is one important difference in this mode – the queue names are fully qualified with their queue manager name as you can see in the screenshot below. 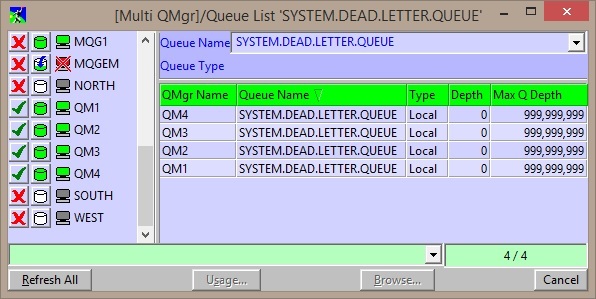 Imagine you needed to make a change to all your dead-letter queues around your estate. Now you can select them all in a Multi QMgr list and make the change in a matter of a few clicks and keystrokes. In this case, when you Open… the definition dialog up, you can see that the queue names are fully qualified with their owning queue manager. Imagine how easy it can now be to make wide-reaching changes to attributes on your MQ object definitions. This entry was posted in MO71, MQGem tools and tagged commands, GUI, IBM MQ, IBM WebSphere MQ, MO71_Jun2016, MQ, tools, WebSphere MQ by mqgem. Bookmark the permalink.